When my wife Stephanie and I began dating twenty years ago, the relationship moved at warp speed, driven by good looks (hers) and deep conversation (a team effort). We spent long hours together, trusting each other with our most treasured thought-gems; our dreams and successes, insecurities and failures. The more we revealed our innermost secrets, the deeper the bond grew. Each deep-thought transfer carried a piece of heart and soul with it. Talk quickly turned to marriage. We plotted a course that would involve two job changes and a move to another state. And as big as all this was, it was happening entirely between just the two of us. When friends would ask how things were going, we might give a simple answer, then move on to another subject. Meanwhile, Stephanie and I would glance at each other and smile. We knew big things were ahead. When you have a deepening walk with someone you love, secrets take on a meaning that goes beyond shared knowledge. The longer you savor the secrets, the deeper the bond penetrates the heart and soul of a relationship. Now, here’s the kicker: God enjoys having secrets that are exclusive between the two of you. The special bond that comes from creating, sharing, and keeping secrets is not reserved for human relationships. God wants in on the action, too. 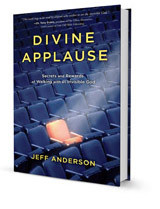 This idea of secrets is a central theme in my new book, Divine Applause. Available now on Amazon – or – here. Here’s a secret… we were honored to be in three Amazon top-ten lists this week, including a #1 Bestseller!